Well, you guessed it. TODAY is my BIRTHDAY!!! But it’s not just my birthday, it’s my good friend Ali’s birthday as well. Like, same day AND same year, and we’ve known each other pretty much forever (our dads worked together in the pinball/video game industry). 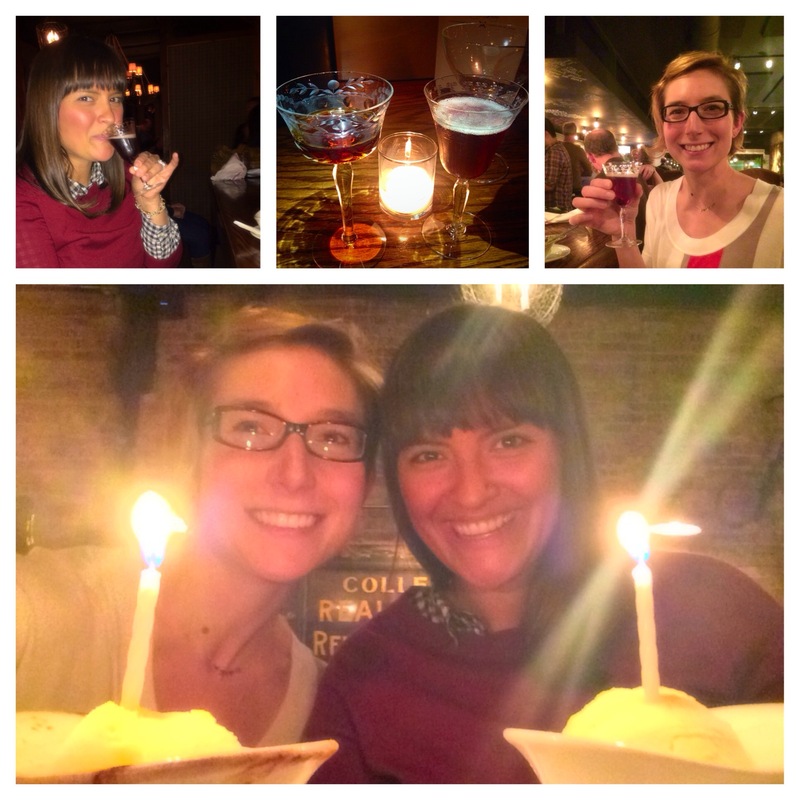 So it was only appropriate that we meet up for a little birthday celebration! Last time Ali came by me to Tête Charcuterie, so this time I headed north to Found Kitchen and Social House, located in the heart of Evanston. I had heard a lot of good things about the restaurant during the week, so my expectations were pretty high! My first impressions when I entered Found: cozy, comfortable, lively, eclectic. The decor reminded me of Salvage One, antiques and unique finds every place you look. We were told there would be a 45-minute wait without a reservation (book early! ), but it didn’t take that long to be seated. Ali and I had a drink at the bar before we sat down: she a Manhattan, and a Punch special for me. That day the Punch was made from bourbon, apple cider, and I honestly can’t remember much else (must take better notes). Bourbon is a little strong for my liking, but this drink was quite tasty. I forget that some cocktails are best sipped. We sat at the counter with a pub-height bench for two. Now, if I didn’t know Ali well, this could have been completely awkward. It was a little difficult to get in and out of the bench seating, but would be perfect for a date! We also had an excellent view of the wood-fire oven and the chefs, so that was really nice. The menu is made for sharing, so we started with a kale and Swiss chard salad that had nuts, seeds, and cranberries with a light vinaigrette. Let’s just say my portion left my plate pretty quickly. I could eat mountains of this salad! 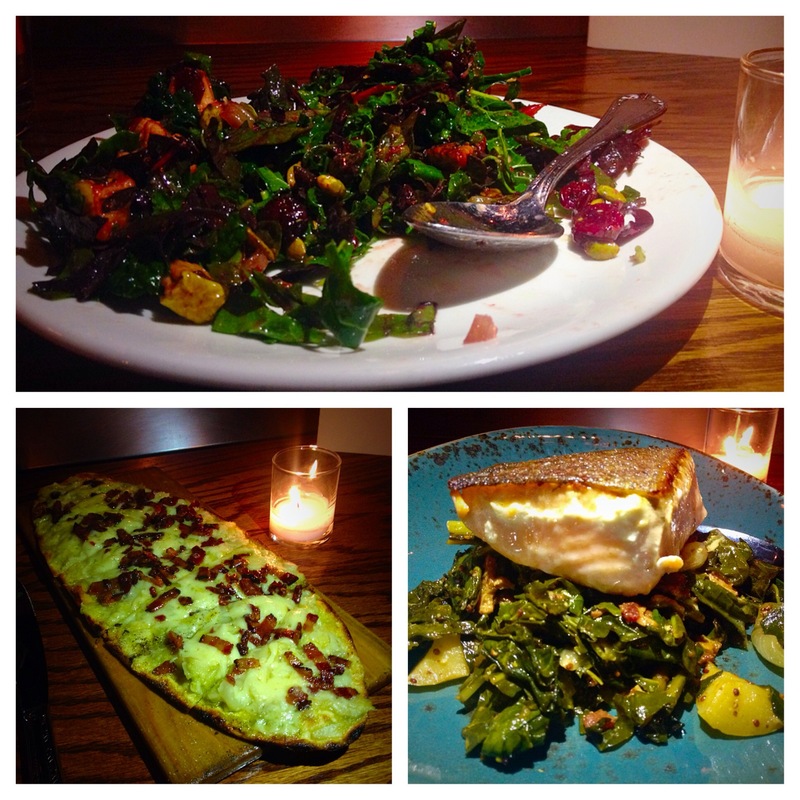 For our entree, we enjoyed a salmon special on top of sautéed greens with more bacon! The fish pretty much melted in my mouth. I’m not a huge salmon fan, so let me tell you this was probably the best salmon I’ve ever had. As if I wasn’t pleased enough with our menu choices, we opted for mango sorbet for dessert. Our waiter–who was wonderful, by the way!–was so sweet to put birthday candles in our ice cream. Ali and I made a joint wish (I can’t tell you or it won’t happen! ), and I savored each bite of my sorbet. 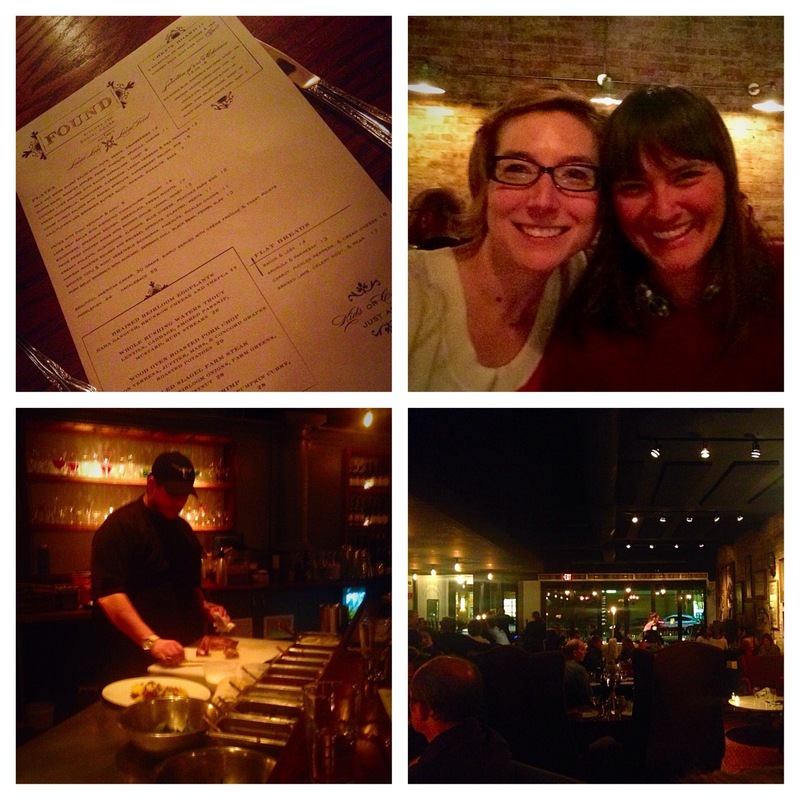 This restaurant is truly a gem for Evanston. I love how they value local cuisine, have excellent service, and I enjoyed the decor. Book your reservation for Found now!